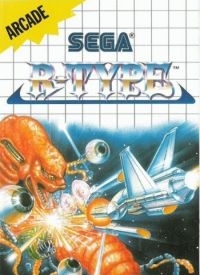 Box Text: It's R-TYPE arcade action for your Sega System! 01-29-2016 Flashback2012 Box Text It's R-TYPE arcade action for your Sega System! The galaxy is in deep peril: foul creatures from the evil Bydo Empire have warped across space to invade and conquer our planet! There is only one hope for victory. The Earth Defense League has chosen you to pilot R-9, a nuclear-powered space fighter that can cut through invading aliens faster than a light saber through butter. 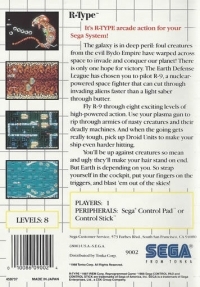 Fly R-9 through eight exciting levels of high-powered action. Use your plasma gun to rip through armies of nasty creatures and their deadly machines. And when the going gets really tough, pick up Droid Units to make your ship even harder hitting. You'll be up against creatures so mean and ugly they'll make your hair stand on end. But Earth is depending on you. So strap yourself in the cockpit, put your fingers on the triggers, and blast 'em out of the skies! This is a list of VGCollect users who have R-Type in their Collection. This is a list of VGCollect users who have R-Type in their Sell List. This is a list of VGCollect users who have R-Type in their Wish List.